Scroll down for the complete Table of Contents. Here at the top of the page, you will find posts related to my school's D2L to Canvas transition. I keep my use of the LMS to a minimum, but I am excited that Canvas courses can be public and how they can also contain live content. See below for details! Growth Mindset Playground. This is a Canvas course made public: no log-in of any kind is required! Overall Course Design: These posts provide an overview of my course design strategies. 10 Ways to Give Your Students the Gift of Slack. Yep, it's SLACK that matters... not grit. Giving your students slack is a great gift to give. Un)Grading. This is a guest blog post for Starr Sackstein's Ed Week blog. Grading. I wish I could not give grades at all; this represents my best attempt to reduce my participation in the grading process to zero. Grading: What the Students Say. 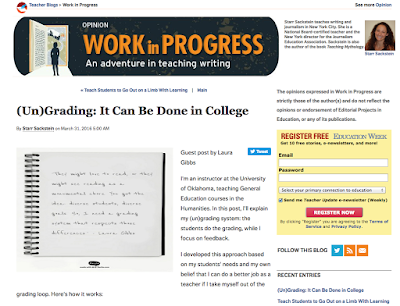 This is a collection of student comments about grading from the end-of-course-evaluations. Writing-Feedback-Revision. Providing feedback that students use to revise their writing is how I spend most of my time each and every week. Tech Tips. Even though it's just extra credit, teaching students about web-based tools is a fun part of the class for me! Randomization Wonderland. This post explains how I use randomization both for course content and for student participation (comments). Traditional Syllabuses. I recently had to prepare traditional syllabuses for my classes, so if you are curious, you can take a look. Growth Mindset. Starting in Fall 2015, I've made Carol Dweck's "growth mindset" an explicit component of my classes, hoping to promote a growth mindset among my students and in my own work too! Growth Mindset: Making Learning a Priority. Dweck's research alerts us about the different ways people process feedback, based on their mindset. 10 Reasons Why Growth Mindset Works for Me. After a great semester of growth mindset, these are my observations. Revision Challenges: What the Students are Choosing. I redesigned the revision assignments with a growth mindset / challenges approach! Scheduling and Pacing: One of the most powerful aspects of teaching online is the flexible scheduling..
Self-Scheduled, Not Self-Paced. This post explains the overall scheduling strategy which I use in my courses. Sample Assignment Schedules. These sample schedules can help the students turn this class into a M-W-F class, a T-Th class, or a weekend class — whatever works best! Week 8: Review Week. During "humpweek" both classes have some special self-assessment and student-to-student interaction assignments. The Grace Period. This post explains the "grace period," a no-questions-asked extension available for all class assignments. Spring 2015: Grace Period Reminder Tracking. I am trying to find ways to intervene with students who get grace period reminders every day. The Half-Reading Option. The "half-reading option" is another way I am trying to accommodate my students' busy and chaotic schedules. Safety Nets. This post provides an overview of the various safety nets to support students with time management and workload management. Orientation Week: These posts are dedicated to the special activities for the Orientation Week. Favorite Places: The First Blog Post. This is the first blog post that students publish during the Orientation Week - a fun way to get used to Blogger and including images in blog posts. Proofreading Skills Assessment. One of the Orientation Week activities is an assessment of students' proofreading skills. Storybooks and Portfolios: These student projects are the heart and soul of my classes! Storybooks: The Big Picture. I try to give an overview of the whole Storybook project. Whew! That was not easy to do! The Portfolio Option. This explains the Portfolio option, a blog-based alternative to the Storybook website. Storybook Schedule and Free Passes. This provides an overview of the weekly Storybook schedule, along with the free-pass system. Student-Created Content for Long-Term (Re)Use. Here I explain the many ways in which I reuse student content semester after semester. The Shift from Teaching Content to ... Teaching Writers. Follow-up on previous: how student content became the goal of my courses. Project Nominations. Each semester the students nominate their favorite projects; this post explains how that process works. Student Blogging: These posts describe the role of student blogging in my courses. 10 Tips for Building a Student Blog Network. These are my thoughts about student blogging as of Spring 2016. Happy blogging, all! Student Blog Assignments. This is a listing of the different types of blog posts that my students complete each week. Weekly Blog Comments. The students read and comment on each other's posts each week. New "Comment Training" Strategy. Starting in Spring 2015, I'm trying to be more proactive in teaching students how to make detailed comments. Comment Walls. Student create "Comment Wall" posts at their blogs where other students can leave comments on their Storybook projects. Inoreader: I use Inoreader to manage the class blog network. Inoreader: Keeping Up With All Those Blogs! This is an overview of how I use Inoreader to manage and organize all the incoming student blog posts. Course Hub Pages with Inoreader. I explain here how I run the course hub pages with the Inoreader HTML Clippings view of the blogs. Tips for Making Good Use of Inoreader. Some more tips and tricks for using Inoreader to manage massive numbers of blogs. Communication Strategies: These posts explain the various communication strategies I use in my courses. Class Announcements. The daily class announcements are the most important element in my overall communication strategy. 10 Reasons Why I Use a Blog for Class Announcements. The announcements are crucial, and I need a real tool to create them. Sunday Email Reminder. On Sunday, I contact students about any work pending they still have to complete for the week. The Stack (Storybook assignment list). The Stack is how I communicate with students about the assignments they've turned in and my progress in returning comments to them. Class Twitter Account. I have a dedicated class Twitter account; this post explains my daily routine for using the account to communicate with students. Spring 2016 - First Email: Connecting. This is an email sent out in November 2015 to students enrolled for Spring 2016, letting them know more about the course and what to expect. Content Development: This explains the various tools I use for content development and sharing that content with my students. The UnTextbook: An OER Interview. This post provides an overview of the UnTextbook that I developed for the Myth-Folklore course. Student Feedback on the UnTextbook. Each week, the students provide me with incredibly valuable feedback about the reading they did that week! LibriVox: Free Audiobooks. One of the things I like best about the UnTextbook is being able to include audiobook versions of some of the readings. My Pinterest Class Portfolio Boards. This post explains how I use Pinterest to create portfolios for the two courses I teach and how I share those Boards with my students. Indian Epics UnTextbook: Table of Contents Emerging. This is the latest update on my plans for an UnTextbook in the Indian Epics class. Indian Epics UnTextbook and BIG Reorganization. Planning the UnTextbook has result in a great idea for reorganizing the semester flow! Indian Epics Untextbook: This is where I will document the development of an UnTextbook for the Indian Epics class. First Brainstorm: An UnTextbook for Indian Epics. This is how I will be spending summer 2015... and what a great summer it is going to be! Retooling my Indian Epics Resources Blog. I can expand my existing resources blog to create an interactive curation space for the UnTextbook. Indian Epics UnTextbook Report: Timeline. This is Part 1 of my write-up on the big redesign for the 2015-16 school year. Part 2: Content Curation and Student Choice. This is Part 2 of the Indian Epics UnTextbook Report write-up. Do you know who to contact to make money? Come to us and get wins everywhere and always. live dealer passion Win and do not be afraid of anything, only victory can be with us.